Is This London's Most Overblown Plaque? M@ Is This London's Most Overblown Plaque? 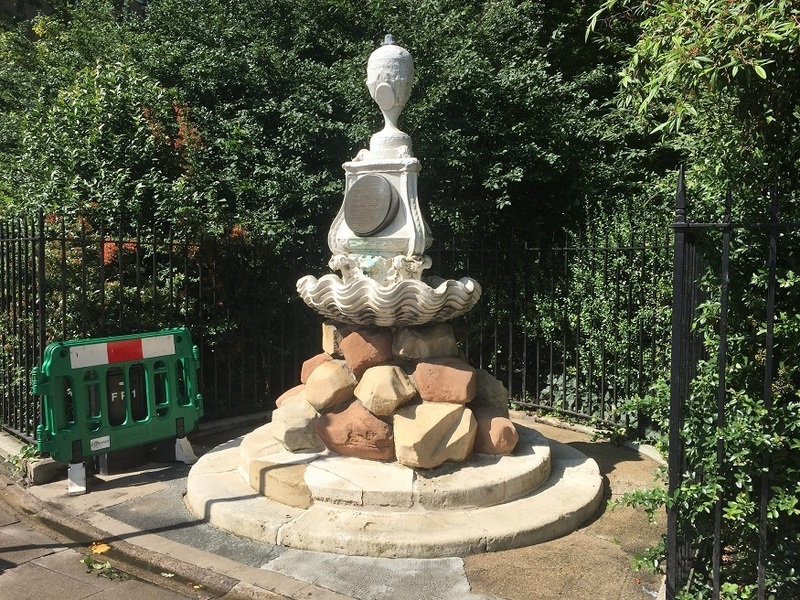 Walking past Bryanston Square in Marylebone, our eyes were drawn to this pretty little drinking fountain. It was designed by Julia Clara Pitt Byrne (1819-1894). She sounds like a remarkable person. Her writings cover everything from celebrity gossip to workhouse abuse to Flemish interiors. She also had the skills to design this truly unique piece of public ornament. 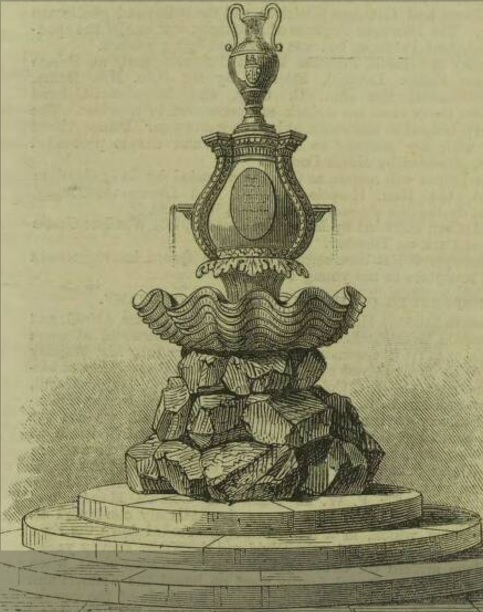 The fountain when new (1863). It seems to have lost the handles on the urn at some stage. Image (c) the Illustrated London News group, courtesy of the British Library Board. 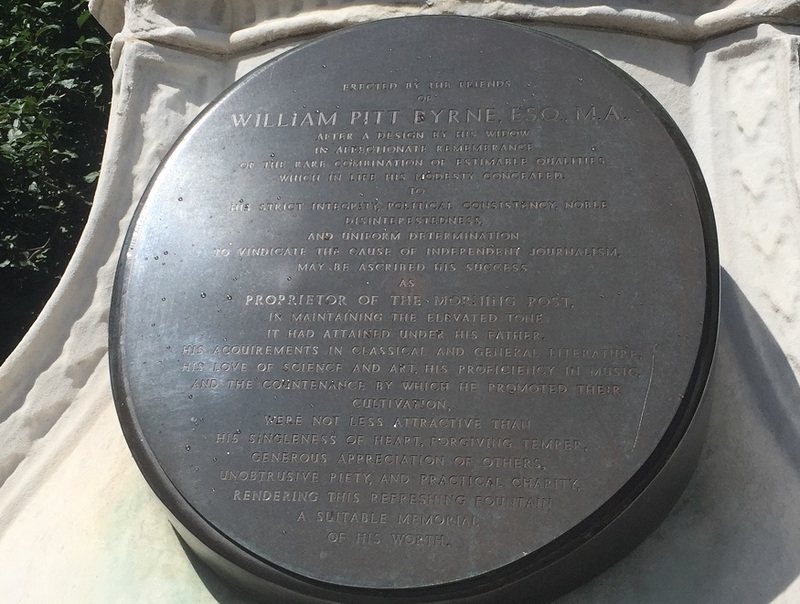 The monument is dedicated to her husband William Pitt Byrne, editor of the Morning Post who died in 1861 and lived on nearby Montague Street. The biggest gush comes not from its fountainhead, but from the attached plaque. The Victorians are known for their bombastic, overblown language, but this tribute reads like satire. Erected by the friends of William Pitt Byrne, Esq. M. A. after a design by his widow in affectionate remembrance of the rare combination of estimable qualities which in life his modesty concealed. To his strict integrity, political consistency, noble disinterestedness, and uniform determination to vindicate the cause of independent journalism, may be ascribed his success as proprietor of the Morning Post, in maintaining the elevated tone it had attained under his father. As any journalist knows, keep your opening sentences punchy, and don't use long words. The plaque continues with a torrent of superlatives. His acquirements in classical and general literature, his love of science and art, his proficiency in music and the countenance by which he promoted their cultivation, were not less attractive than his singleness of heart, forgiving temper, generous appreciation of others, unobtrusive piety, and practical charity, rendering this refreshing fountain a suitable memorial of his worth. It seems that Byrne really was a god amongst men. Or, as the wonderful London Remembers site puts it 'He sounds a stubborn prig, doesn't he?'. Either way, given that Byrne was an editor, we feel the need to take a red pen to the memorial. Here's a more succinct version. To the memory of William Pitt Byrne, editor of the Morning Post and all round good egg. Erected by his mates.